All those people attending the 75th anniversary celebration of Jewish War Veterans Post 125 gathered for a portrait. Attendees at the 75th anniversary celebration of Jewish War Veterans Post 125 on June 12 faced a minor hurdle before dinner could be served. The event photographer asked all 124 people to squeeze together for a group portrait. The large-scale photo of smiling veterans and their proud families will be displayed in the JWV room at the Ruth Hyman JCC of Greater Monmouth in Deal. The anniversary of the Asbury Park-Ocean JWV post marks a major milestone for members, said post commander Norman Ginsburg of Ocean Township. The celebratory dinner was held at Congregation Torat El in Ocean and included veterans from World War II to the present-day conflict in Afghanistan. 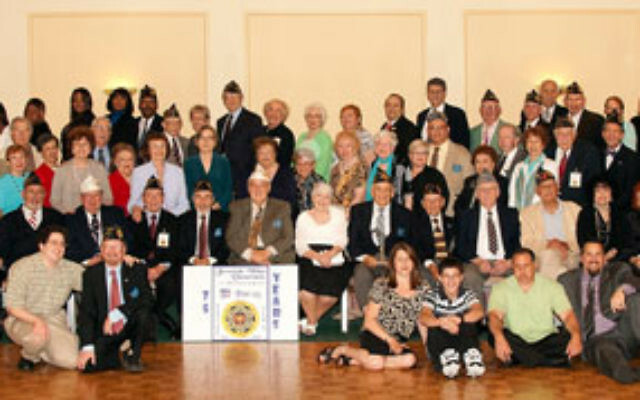 This August, the post will undergo an official name change to Jersey Shore Jewish War Veterans Post 125, the result of its recent merger with Long Branch Post 316. The same values that prompted post member Dr. Lewis Wetstein of Interlaken to join the Air Force 33 years ago are shared by the newest member of the post — Wetstein’s 20-year-old son, Berish, who returned in March after a seven-month tour in Baghdad. Dr. Wetstein retired last year after serving as commander of the 514th Aeromedical Evacuation Squadron at McGuire Air Force Base, and as state air surgeon for New Jersey Air National Guard. For Stanley Shapiro of Ocean Township, who served in the Korean conflict, military involvement is a family matter. “Every one of my 11 male cousins served in the military. Many of us encountered servicemen who told us they had never met a Jew before,” said Shapiro, who serves as chief of staff with the Department of New Jersey JWV, as well as commander with the Monmouth-Ocean Council. Shapiro signed up for JWV one month after he got out of the U.S. Navy in 1956. Among its missions, Post 125 aims to help hospitalized vets, arrange visits to veterans’ homes, and raise money for charities. Each Memorial Day the post places flags on the gravesites of nearly 700 Jewish war veterans.